Melt 3 tbsps. butter or margarine in 9” round or 8”x8”x2” square pan. Sprinkle with ½ cup brown sugar. Over sugar arrange 4 slices Dole pineapple and Maraschino cherries. Set aside while mixing cake part. Cream 1⁄3 cup shortening with ½ cup sugar. Add 1 egg, unbeaten, and 1 tsp. vanilla. Sift together 1¼ cups sifted flour, ¼ tsp. salt, 1½ tsps. baking powder. 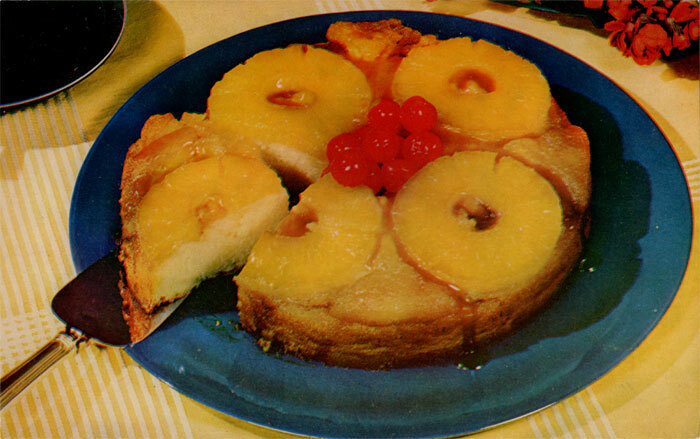 Add to first mixture alternately with ½ cup syrup drained from pineapple, beating smooth after each addition. Spread batter over pineapple in pan and bake in moderate oven (350°) 50 to 60 min. Turn out on plate, serve warm with whipped cream. This postcard is in honor of Chronicler’s Kitchen Krafts find. I haven’t tried the recipe yet, but surely any company-sponsored recipe found on the back of a cheap, hyper-saturated, out-of-register postcard from the mid-60s has got to be delicious, right?